Be the first to share your favorite memory, photo or story of Sarah. This memorial page is dedicated for family, friends and future generations to celebrate the life of their loved one. Sarah J. Logan, 82, of Coralville, died Saturday, November 10, 2018 at Legacy Gardens in Iowa City. Visitation will be held Sunday, November 18th at Lensing Funeral & Cremation Service in Iowa City from 4:30 to 7:00 pm. The funeral service will begin Monday at 10:00 am at Grace Community Church in North Liberty. Burial will follow in Oak Hill Cemetery in Coralville. Instead of flowers and plants, memorials may be directed to the Gideon Memorial Bible Program or Grace Community Church. Born March 16, 1936 in Concord, North Carolina, the daughter of Calvin and Tessie (Stafford) Johnson, Sarah grew up in Fayetteville, North Carolina. She attended UNC in Greensboro, NC, Kirkwood Community College and the University of Iowa. Sarah married Michael Logan September 17, 1957 in Fayetteville. They moved to the Iowa City area in 1958. She worked for the Iowa City Community School District for 9 years as a secretary to the principal at Northwest Junior High School in Coralville. She later worked as a secretary for ACT in Iowa City for 20 years – retiring in 1999. Sarah was a member of Grace Community Church and Beta Sigma Phi. 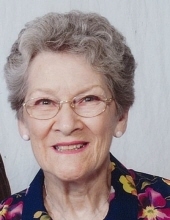 She enjoyed reading, crossword puzzles, spending time with family and camping. Survivors include her sons, Mark Logan (Kim) of Springfield, Missouri and their children, Jessica Bolerjack (Nathan) and their son Titus, Emily Logan Prier and her children Dallas and Riley, Daniel Logan and Hannah Logan; Brad Logan (Krista) of Coralville and their children, McKenzie Logan, Carson Logan and Quinton Logan; a sister-in-law, Linda Johnson of Gastonia, North Carolina and several extended family members. She was preceded in death by her parents, her husband Michael in 2014 and her brother Charles in 2018. To send flowers or a remembrance gift to the family of Sarah J. Logan, please visit our Tribute Store. "Email Address" would like to share the life celebration of Sarah J. Logan. Click on the "link" to go to share a favorite memory or leave a condolence message for the family.